We woke up July 21st and Colt made a nice big breakfast. We put Duke down for his morning nap and enjoyed our food while watching Grey's. This was starting out to be a typical Saturday morning. The feelings from the night before gradually started creeping in again mid-morning. I felt my heart start pounding, my hands get shaky, and I found myself needing to take really deep breaths. It was like I was breathing through a giant straw. Not this again, I thought. I told Colt it was happening. We sat on the couch and I just tried my best to relax and breathe. It persisted throughout the rest of the morning and in the afternoon it really began to escalate. We put Duke down for his afternoon nap and I told Colt that once he woke up and ate, I needed to go to the hospital. I called my parents, crying, saying that something wasn't okay with me. We called Colt's dad and while he didn't think anything was physically wrong with my heart, he said if I felt like I needed to go to the ER, then I should. In the midst of these phone calls, everything was getting worse. I was tingly, shaky, feeling a hot/cold sensation in my chest, and having trouble breathing. Leaving after Duke's nap was not an option. We needed to leave now. 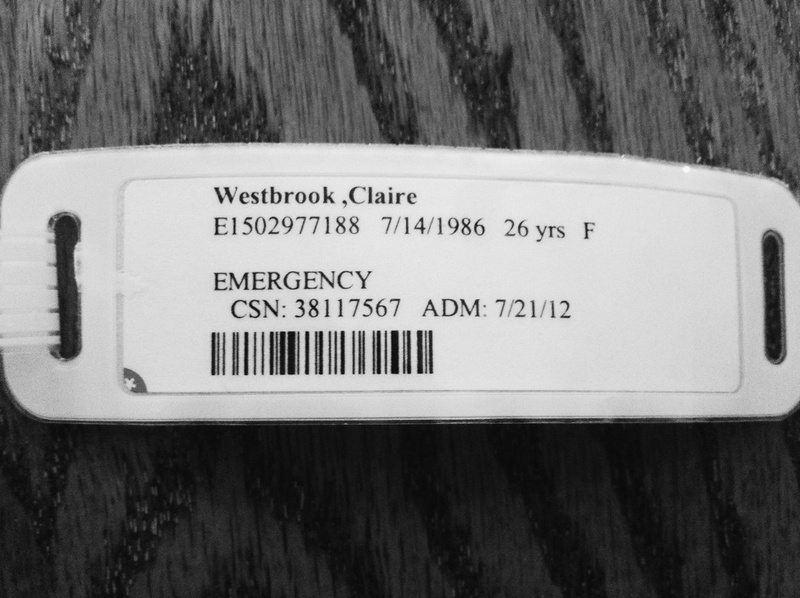 The trip to the hospital was one of the worst moments in my life. 15 minutes felt like an hour. My mind was racing with thoughts like, What if I'm dying? What will Colt and Duke do without me? What's going to happen? What if something is seriously wrong with me? What if my life is never the same? I was so scared. I spent the whole day rubbing and holding my chest so when I walked into the ER, the receptionist didn't hesitate to ask calmly, "Chest pain?" Yes. Chest pain. I was crying and could hardly get my name, number, and address out of my mouth. In an attempt to prevent the nurse from thinking oh, here comes another one of those panic attack patients, I told her that I am never sick and I never go to the doctor. In other words, I'm not just coming to the ER for kicks and giggles. I also told her that all of this started while watching "The Dark Knight Rises." She tilted her head, put her lips together, and nodded. It was as if I was the 50th person to say that to her. I didn't love that reaction, but she was otherwise kind and she was helping me, so I didn't let it upset me. She quickly got my blood pressure and heart rate. They were fine. Again. Although that was good news, I wanted there to be something immediately wrong. I wanted a fix for my body. We sat in the waiting room and I decided to go ahead and nurse Duke before our name was called. Nursing a squirmy 9 month old in public when you think you're dying is something I'd never wish upon anyone. However, it gave me something to do. My name was called and I couldn't get to the doctor fast enough. They listened to me explain my symptoms and they said it sounded like a panic attack/anxiety. I thought this was odd since it'd been almost 24 hours. Do panic attacks really last that long? They monitored my heart rate and checked my blood pressure again. Still normal. The EKG was normal. The chest x-ray was normal. Everything was normal ... except me. Even as they assured me everything was fine, the pain in my chest increased. I felt so lost. They gave me a shot of something that was supposed to calm me down. It didn't do much, so it was followed with a GI cocktail. It wasn't long before I felt calmer and the burning in my chest subsided. They prescribed Hydroxyzine for me to take when necessary and I was on my way. I couldn't believe this. Have I really been diagnosed with anxiety? Does something like this just pop up on someone out of the blue? I didn't want to believe it. And I wasn't really okay with it. But at the moment, I didn't care. I just wanted to feel like my normal self. We spent the rest of the day with my family at my brother's house. It was a good distraction and it was comforting to be with them. Before going to bed that night, Colt and I had a little chat on the couch. He asked me if I had asked God for this. That's an odd question, I thought, and the answer was definitely no. But there was a part of me that felt like something about this had to do with God. I explained to Colt that I have felt like there was a wall that I just couldn't get over for the past few years. A wall that was keeping me from where I needed to be and who I needed to be. But I didn't know how to get there. I didn't know how to get to the other side of this wall. I cried and we prayed for answers. Looking back, the past two days had been horribly painful and depressing. Aside from the physical pain I was feeling all over my body, my mental state was taking a beating as well. I had basically been told that I had experienced a panic attack and been given medicine to "fix" myself when the anxiety came back. One day I was doing great and the next I had to take a pill to feel okay. This didn't settle well in my mind or my heart. What was wrong with me? There was this overarching heaviness on my soul. This was the very definition of anxiety. I wasn't truly present in any moment that day and I wasn't able to enjoy anything - time with Duke, time with Colt, a good meal, nothing. It was all laced with a deep anxiety and sadness that was weaving throughout my entire being. I was overcome by it. Even though my mind was reeling that night, I managed to fall asleep. Would tomorrow be the same? Would it be a new day? I was hoping for a fresh start but had a feeling I wouldn't be so lucky.